As children, Jessie Cole and her brother ran wild in an idyllic rainforest home. They had adoring parents and two beautiful half-sisters, who visited every holiday. But when Jessie was on the cusp of adolescence, tragedy struck, and her loving family fell apart. Join Jessie in conversation about Staying, her powerful memoir about family and forgiveness and finding peace in a place of pain. Nature Writing is the hottest trend in literature. Join expert nature writers and eco-critics Inga Simpson (Where the Trees Were), Dr. Thomas Wilson (Stepping Off: Rewilding and Belonging in the South-West) and Jessie Cole (Staying) to discuss the changing face of nature writing. 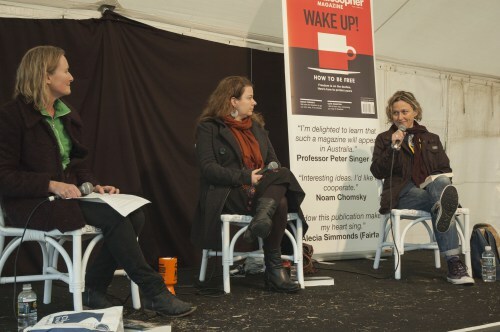 For a great write up of Jessie’s panel with Inga Simpson, check out the Byron Bay Writers’ Festival Blog Post: The Nest Isn’t Always Safe: The Topic of Home with Jessie Cole and Inga Simpson. And another BBWF Blog Post: Into the Wild: Robyn Davidson, Claire Dunn, Jessie Cole and Felicity Volk.